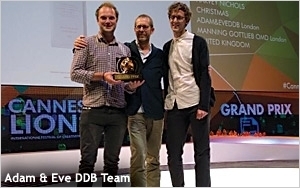 It is the shop’s second Grand Prix award for the same campaign, which was also awarded the top prize in the Promo and Activation Category earlier in the week. Remi Babinet of BETC Paris and this year’s Press Lions jury president tweeted that the press jury was “looking for simplicity, intelligence, beauty,” from the 5,000 entries for Press Lions this year. The campaign also included online video, in-store and cinema advertising. There were also 21 Silver Press Lions awarded and 50 Bronze Press Lions, with 18 of the latter awarded to entries from Brazil.